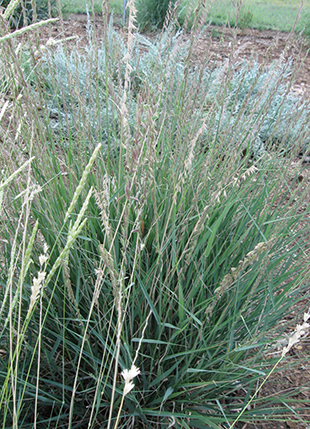 Sideoats Grama Grass is a native, warm season grass growing 18″ – 3′ tall. It produces a nutritious, high quality forage that is a favorite of livestock. A good seed producer, it can be found on well-drained soils and even in rocky areas up to 8,000″ elevation. It is considered excellent for conservation use and grows well, due to vigorous seedling production. 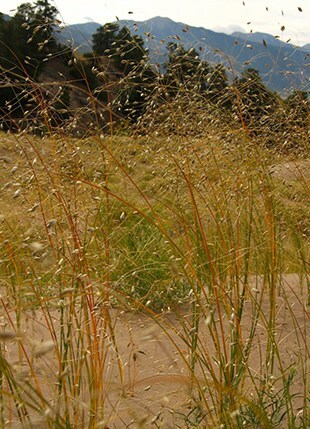 This is a native, warm season bunch or sod forming grass growing 18″ – 3′ tall. Sideoats Grama produces a nutritious, high quality forage that is a favorite of livestock. A good seed producer, it can be found on well-drained soils and even in rocky areas up to 8,000″ elevation. It is considered excellent for conservation use and grows well, due to vigorous seedling production. Warm season grasses, tend to work on establishing deep roots during the first two years of life, and then growing during their second and third year. They are slow to establish, often frustrating gardeners during their first year if seeding a meadow when weeds and other aggressive plants can take hold until it gets established. These grasses are best planted in late spring. Fall planting is not recommended. If you seed warm season grasses in the fall, they will stay dormant and emerge in the spring. These grasses also tend to stay low during the cooler parts of summer, and put on their full height in the heat of the summer. Pricing is for Niner variety, please call for pricing on other varieties. Small Areas: 1-2 lbs. per 1000 sq. ft.